I can confirm that the text on both cards is indeed in German. 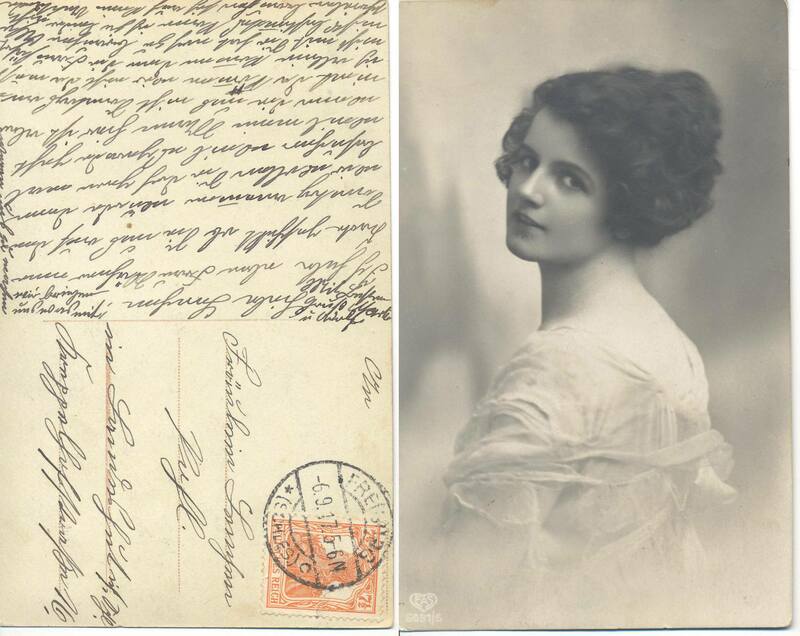 Your first card is dated to 1920, the second one seems to have been stamped by the post office in 1917. 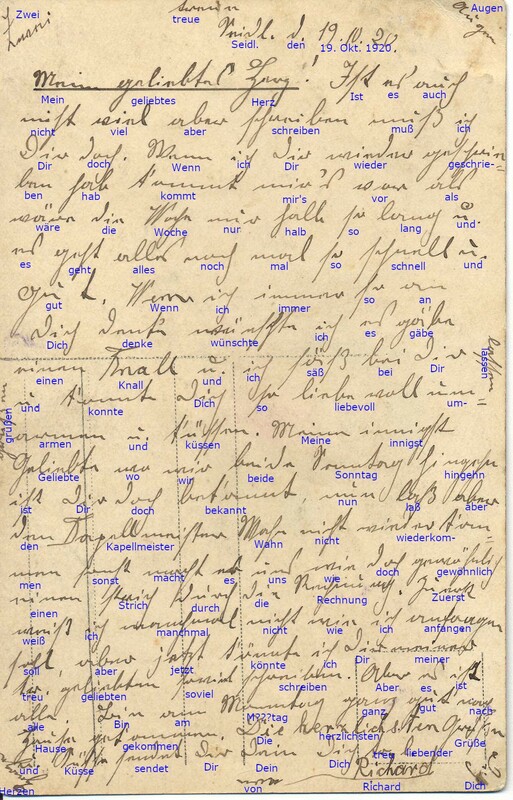 As far as I know Sütterlin was only developed in 1911 and taught in schools from 1915 on, so the people writing these cards would have learned another form of Kurrent rather than specifically Sütterlin. The basic letter shapes are the same, though, and differences are somewhat lost in handwriting. Also, some words or single letters of a latin script were mixed in. I have attached my attempt at transliteration in the form of annotated images and added some remarks below. The first card was written by someone named Richard to his "loved one"; a name or place of residence for the recipient is not given. The place where the card was written is only abbreviated as "Seidl. ", which I cannot currently associate with anywhere. 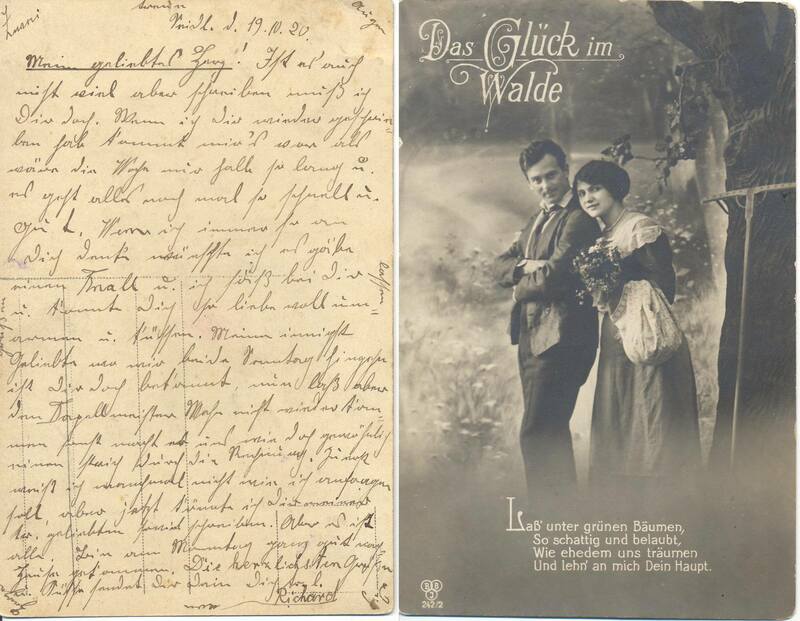 The text suggests that he is writing to his fiancée (or at least a woman of similarly close relation) and that he is looking forward to seeing her the following weekend. This isn't spelled out in full detail, but it seems the woman has intermittent mental health issues, which might preclude them from enjoying the weekend as planned. There is one word near the end that I have trouble with. It clearly starts with an "M", ends with "tag", and a weekday would be expected from context. This would imply "Montag", but the letters in between don't really fit that interpretation. A separate greeting is added running around the margins. 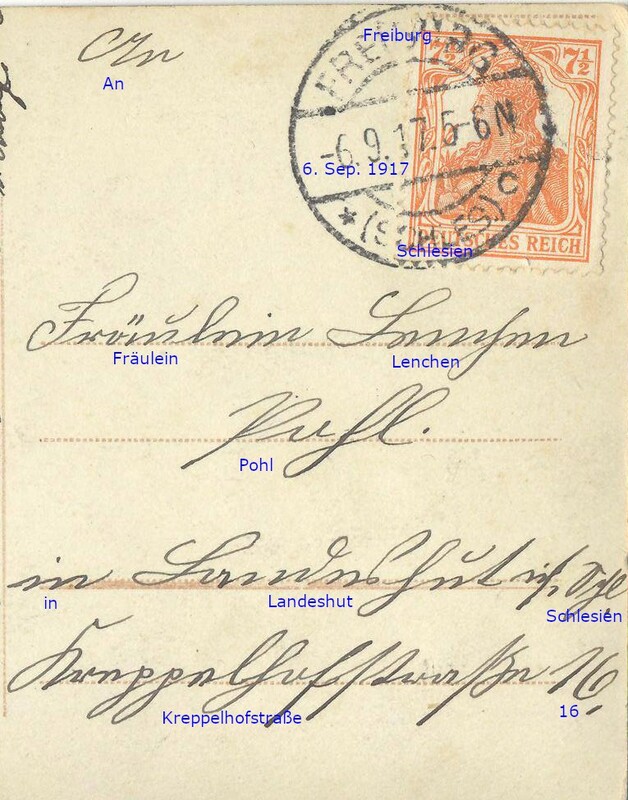 The second card was stamped in Freiburg/Schlesien (nowadays https://en.wikipedia.org/wiki/Świebodzice) and addressed to an unmarried woman named Lenchen Pohl, living in Landeshut/Schlesien (nowadays https://en.wikipedia.org/wiki/Kamienna_Góra). The card seems to be written by a married couple and talks about their plans to visit the recipient. The handwriting on this card is quite a bit worse than the first card, in particular towards the bottom of the page when they ran out of space. They also continued writing the last few words along the margins and then squeezed the greeting into the upper left hand corner. The name of the first person signing looks like "Martin", the second one is more difficult. To me it looks like "Adelheid" with the last few letters just trailing off, but this is speculation. There seem to be several spelling mistakes and punctuation is somewhat irregular. Several words don't really make sense to me, but I see no other way to transliterate them. Not the answer you're looking for? Browse other questions tagged germany palaeography military-records world-war-2 or ask your own question. 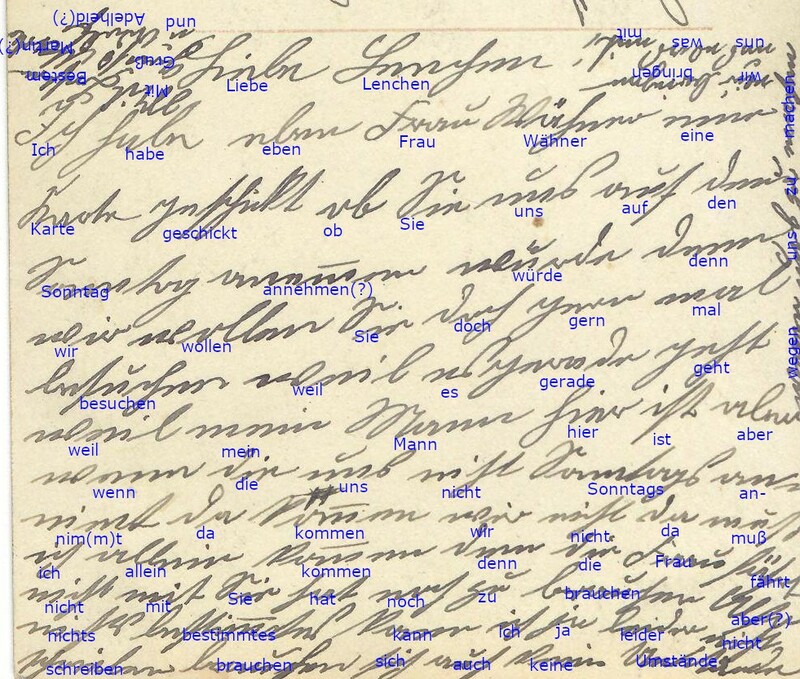 Finding information on German soldiers from World War I and World War II? Requesting copies of WWII Draft Registration cards? Looking for evidence of my grandfather's German citizenship? Reference Key for Injuries for WWI German Casualty Lists? Finding my father's Royal Navy record for WWII? Identifying German soldier in WWII from single photo?